Sutherland Macdonald was considered by many to be one of the greatest artists in the history of tattooing. It is said that his first exposure to tattooing was in the British Army in the 1880s. Already being an accomplished artist, Macdonald picked up the tattoo needles with ease. It was after getting out of the army that he started tattooing professionally. 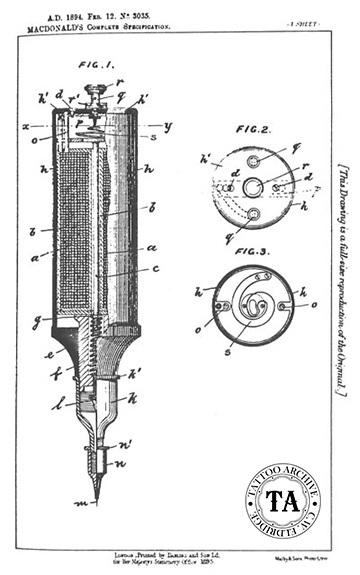 He worked first with hand tools, and in 1894 received a British patent for his electric tattooing machine. An 1897 Strand Magazine article written by Gambier Bolton stated, "that for shading or heavy work Macdonald still used Japanese tools, ivory handles and all". Macdonald's first shop was located in Aldershot, England. He later moved to London and set up shop at the #76 Jermyn Street, upstairs from a Turkish bath. He spent the rest of his career at this location. Sutherland Macdonald was at the forefront of the early 1900s tattoo fad, and probably did his share of cosmetic tinting. Because of his years as a tattooing sergeant-major in the Royal Engineers, George Burchett felt that Macdonald had an advantage over him in the competition to tattoo the "leisured people of taste". 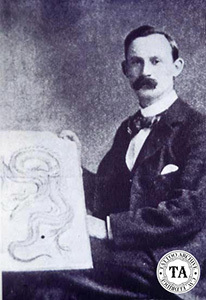 George Burchett wrote about Macdonald in his book, Memoirs of a Tattooist. "He had already tattooed officers in many of the famous regiments, including the Brigade of Guards. One of his earliest clients, Lord Byng of Vimy, when a young officer in the 10th Hussare, introduced Macdonald to scores of young bloods in his circle. When Macdonald exchanged his sergeant-major's uniform for the white coat of a full-time tattoo artist he was already assured of a good following". Sutherland Macdonald's contributions to the tattoo world went farther than art and celebrity. As stated earlier, he was granted a British patent for a tattooing machine (patent #3035), although it may have had too many moving parts to be practical. He is also sometimes credited for adding blues and greens to the tattooist palate. George Burchett also had this to say about his well respected, fellow London tattooist. "For nearly forty years crowned heads and famous people climbed the narrow staircase in Jermyn Street to visit Macdonald and to leave bearing some of the most wonderful ornaments ever placed on human skin. A well spoken, intelligent and gentle man, Sutherland Macdonald made friends of his customers, who treated him as an equal." Sutherland Macdonald died in 1937.